Plan to include establishment of international waypoint, artificial 'island', and full border between Israel and Gaza. Transportation Yisrael Katz has turned directly to Prime Minister Binyamin Netanyahu, he announced Sunday, over his proposal for Israel to immediately stop providing resources and humanitarian aid to Gaza. "Demilitarizing Gaza is a prerequisite to the plan [to stop aid] and to stop Operation Protective Edge." Katz said. "Since the Hamas takeover [of Gaza, in 2007 - ed. ], Israel has failed to respond to changing realities." He added that since Israel chose to "disengage" from Gaza by deporting all Jewish residents and pulling out Israeli security forces in 2005, that "separation" should work both ways. "For many years I have called for a separation program," he added. "[This includes] the cessation of electricity, water, fuel, food, and other supplies; demilitarizing Gaza and removing its weapons arsenal, and creating a border between Israel and Gaza." Katz also called for Egypt, in turn, to end its own blockade on Gaza - and offered a rather creative proposal if they refused to do so. 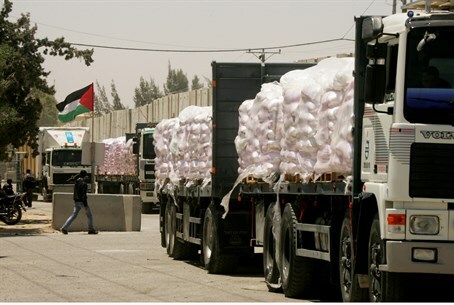 "At the same time, the Rafah crossing should be opened between Gaza and Egypt for goods and civilian traffic under supervision," he said. "In the event the Egyptians refuse to cooperate, we must establish an island, 4.5 km off the Gaza coast in international waters, which will have an airport and a harbor, as well as hotels. The island would be connected to Gaza via a bridge, manned by Israel's national security for 100 years." Katz added that Israel would still have control over Gaza's naval imports, under the plan. However, Palestinian Arab leadership would keep full control of the airport and hotels on the island, "removing responsibility from Israel" and allowing "full freedom" on the Palestinian side while Israel can maintain its security "without fear of weapons smuggling through the sea and skies." If the conditions are breached, he said, Israel will provide deterrence on the Israel-Gaza border and "respond to any rocket fire with full intensity, just like any country from one border to another." Israel provides most of Gaza's water supply, electricity and communications infrastructure - despite the Palestinian Authority's refusal to pay for the service.